You are free to download, print and study the modules. Once you have completed your reading come back and take the multichoice test. If you obtain a pass mark of over 80% you will have the option of printing out a certificate of completion. ability to care for her newborn and it may extend the length of hospital stay. This module covers both prevention and treatment options. Pre-eclampsia is a pregnancy complication characterised by high blood pressure and signs of damage to another organ system, often the kidneys. Left untreated, pre-eclampsia can lead to serious even fatal complications for both mother and baby and the only cure is delivery. Cardiac tamponade is a life-threatening emergency that impairs the ability of the heart to fill and to pump. Although not strictly a perioperative condition it is something that all advanced life support responders should be aware of. This module describes the action of suxamethonium, the inheritance of suxamethonium apnoea, and the non-inherited conditions that can also cause it. The presentation and treatment of the condition are discussed. Very compact and lightweight with extremely simple user interface. 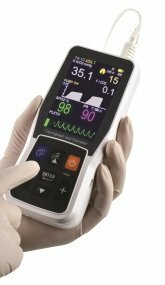 Full colour 7.5cm TFT display monitors EtCO2,FiCO2,RR, SpO2 & PR. Now allows input of patient ID for reporting. Placental abruption is defined as separation of the placenta from the decidua basalis before delivery of the fetus. It is extremely serious and potentially fatal. Latex allergies can be present in both staff and patients. Perioperative workers have to be aware of the causes and consequences of latex products in the operating theatre. This module covers the comprehensive assessment of burns, the steps and considerations involved in surgically treating these injuries. There is significant morbidity and mortality associated with air embolism. It is therefore important to have an awareness of its risk factors, presentation, means of risk reduction and management of the consequences. These are all covered in this module. Length of Study: 60 min. Sickle cell disease is a disorder of the blood caused by an inherited abnormal haemoglobin. The abnormal haemoglobin causes distorted (sickled) red blood cells. When the number of red blood cells decreases from rupture (haemolysis), anaemia is the result. The irregular sickled cells can also block blood vessels causing tissue and organ damage and pain. Electrosurgery or diathermy has allowed faster operating, reduced blood loss and new surgical techniques. It does have its dangers and its safe use in operating theatres requires a grasp of its mechanisms of action and potential pitfalls. Pre-oxygenation is used in anaesthesia to prolong the time to desaturation during a period of apnoea, such as frequently happens upon induction. This can also be thought of a denitogenation. This article covers the science behind it and discusses some patient groups that need special attention. Sugammadex is an effective and safe agent for reversing neuromuscular blockade, in particular all depths of rocuronium-induced blockade. Sugammadex provides a real alternative to neostigmine and this module covers everything you need to know. ECT (Electroconvulsive Therapy) is a treatment that involves sending an electric current through the brain to trigger an epileptic seizure to relieve the symptoms of some mental health problem. This module covers the anaesthetic aspects of it. Length of Study: 45 min. Different patient positions are required to provide access for different surgical procedures. Each position has implications for ventilation and haemodynamics, as well as exposing patients to possible complications such as nerve injury and pressure sores. Intraosseous (IO) access is an alternative method to providing venous administration of drugs and fluids. Commonly used by the military and pre-hospital medics,it is gaining popularity in the hospital setting where intravenous access is challenging or time critical. Rapid sequence induction (RSI) is a method of achieving rapid control of the airway whilst minimising the risk of regurgitation and aspiration of gastric contents. This module covers RSI, its indications and contraindications. Compartment syndrome (CS) is a medical emergency, which needs to be recognised by those involved with the provision of anaesthesia surgery and critical care. This module covers its diagnosis and treatment. Length of Study: 50 min. Maintenance of normothermia in children under going surgery is challenging. There is clear evidence in adults that even mild intra-operative hypothermia is associated with adverse outcome. This short article discusses the problems and what we can do about it. BIS or Bispectral monitoring is a relatively new but controversial technology to monitor depth of anaesthesia. This module covers how it works and if it works.